Posted on July 1, 2015 by Rebecca C.
Here in Michigan, the Little Brown Bat or Myotis lucifugus is the most common. I am assuming this little guy is a Little Brown Bat with a very big mouth. The Little Brown Bat is a relatively small mammal with an olive-brownish to dark yellowish brown colored coat. In Latin, the word Myotis means mouse ear which is great for these Little Brown Bats since they do look like they have little mouse ears. You should hear a bat squeak; it’s almost unnerving. Even though I know they are only insect eating creatures; I am still cautious when approaching them. I guess I have heard too many urban legends in my time. In fact, when I was photographing this one (yes, I brought him in my house to use my backdrop; he was attached to the piece of wood), my mother stopped by. She was more than happy to remind me of all the myths and diseases the bat could carry. I took my few photos and returned the Little Brown bat still on the wood where I found him. 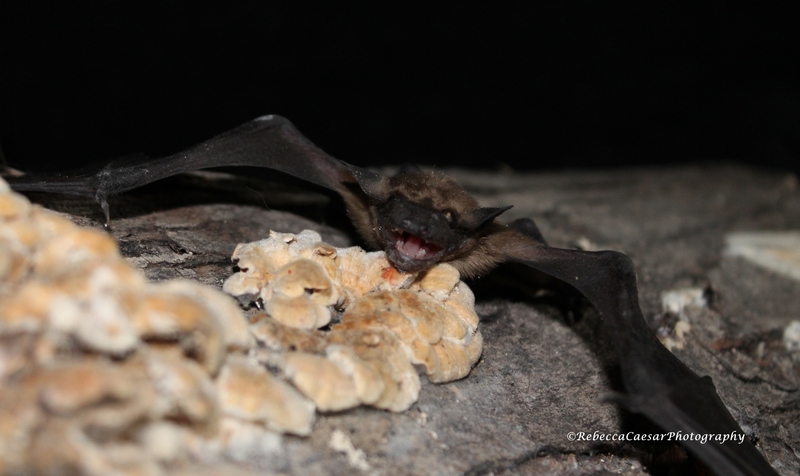 According to the Michigan DNR website, “Little brown bats use echolocation to find and capture prey. They emit pulses of high frequency sound (20-130 kHz) that bounce off nearby objects. The bats then use the echoes to determine the object’s distance, size, and shape. They feed primarily on aquatic insects, including mayflies, caddis flies, and stoneflies. They will also feed on other flies, wasps, moths, and beetles to supplement their diet. Typical summer foraging areas include forest edges, along streams and lakes, and sometimes in small cultivated fields. Young little brown bats can eat up to 1.8 grams of insects/night; lactating females can eat up to 3.7 grams of insects/hour due to increased energy demands” (2014). Of course, I wish they would eat more mosquitoes in my area. I can’t even begin to tell you how bad these mosquitoes are right now. They are horrible in my area.